This colorful molded torte serves a crowd, looks quite elegant on the hors d’oeuvres table, and is easier to make than it looks. Make a day ahead to let set, unmold about an hour before serving with crackers. Place 1/2 cup butter, 3-ounces cream cheese, the 4-ounces chopped ham, 1 tablespoon wine and white pepper to taste; process until smooth. Remove to small bowl, cover and chill. In processor, process another 1/2 cup butter, 3-ounces cream cheese, the parsley, green onion, 1 tablespoon of wine and white pepper to taste. Remove to small bowl, cover and chill. Process remaining butter, cream cheese, the red peppers, remaining wine and pepper to taste until smooth; remove to small bowl, cover and chill. 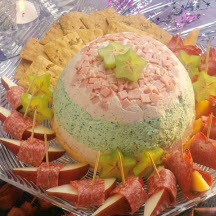 Line a glass 2-quart bowl or glass 9-inch pie plate with plastic wrap; sprinkle in cubed ham; spread the ham mixture, spread the red pepper mixture, and top with a layer of the parsley mixture. Cover and chill overnight. Unmold onto serving plate; let sit at room temperature for an hour before serving.